Manuel Lima, The Book of Trees: Visualizing Branches of Knowledge, Princeton Architectural Press, 2014. Trees are in nature but also in our minds. Their shape have influenced how we communicate via diagrams, link ideas together and illustrate deeper human thoughts in art throughout history. Trees have been a recurrent metaphor for mapping information in numerous scientific domains, such as biology, genetics, sociology and linguistics and information visualisation is a growing area of interest amongst a variety of business practices. This book will expose our long-lasting obsession with trees, as metaphors for organising and representing hierarchical information, and provide a broad visual framework for the various types of executions, many dating back hundreds of years. Trees can be many things: objects, art, symbols, or information. As objects, trees act as homes and shelter, they provide food and oxygen, and they bind soil to hold topography in place. You can read about this in any biology textbook. The most famous use of trees as symbols is the Tree of Life, which recurs in many cultures throughout the world, and which you can read about in Cook (1974). It often appears as a World Tree, which supports the heavens, thereby connecting the heavens, the human world, and (through its roots) the underworld. This motif has appeared in specific forms in many cultures, including Assyrian, Akkadian, Sumerian, Babylonian, Egyptian, Ancient Greek, Nordic (Norse), Celtic, Olmec, Aztec, Mayan, Buddhist, Tibetan, Hindu, and Siberian, among others. The Biblical Tree of Life, on the other hand, was actually the lignum vitae (Tree of Eternal Life) not the arbor vitae (Tree of Life). It was explicitly contrasted with the lignum scientiae boni et mali (Tree of Knowledge of Good and Evil), from which Adam and Eve ate the forbidden fruit, and were thereby ejected from Eden. 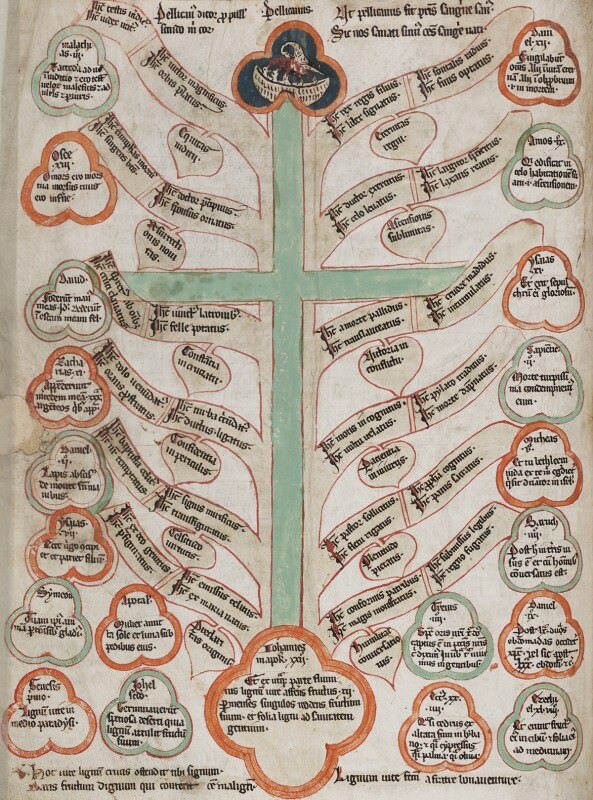 This Biblical imagery was later co-opted as the arbor scientiae (Tree of Knowledge), starting with the Porphyrian tree in the third-century AD (although there are no extant copies from that time). That is, knowledge can often be arranged like the branches of a tree; and indeed, that metaphor has come down to us today when referring to the different “branches” of human knowledge (e.g., branches of science). 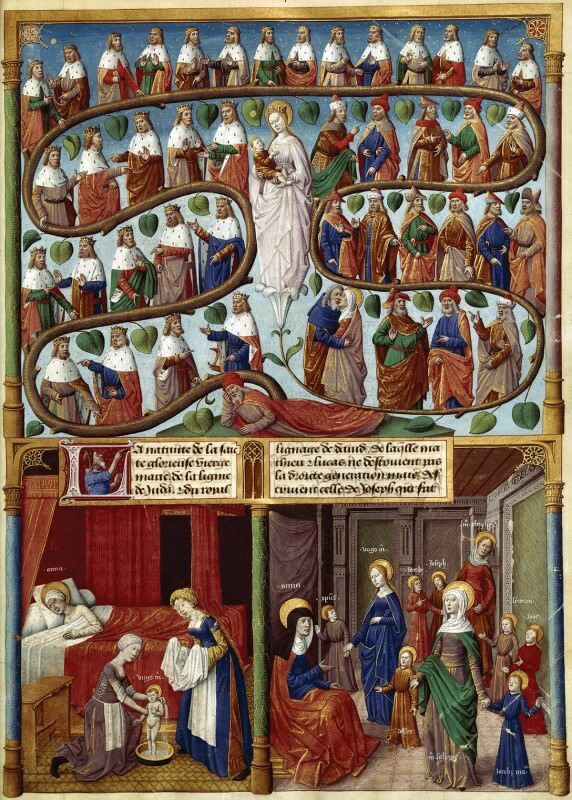 For example, Joachim of Fiore used the tree as a metaphor for historical relationships in his Liber Figurarum of 1202 (Hestmark 2000), a book whose exquisite prints could easily have been included above under “art.” In his book Arbor Scientiae Venerabilis et Cælitus of 1295, Ramón Llull used the tree to illustrate the growth and inter-relationships of knowledge more generally (Gontier 2011; Kutschera 2011). It is with this role of trees as illustrations of information that the two review books concern themselves. They thus represent the latest manifestations of a very long tradition involving visualizations of human knowledge. The tree is probably the most ubiquitous and long-lasting of our visual metaphors, illustrating the relations between objects as well as the relations between concepts. In the modern world the Tree of Knowledge has been greatly generalized, so that trees are now both visual and mathematical representations of the relationships among pieces of information. 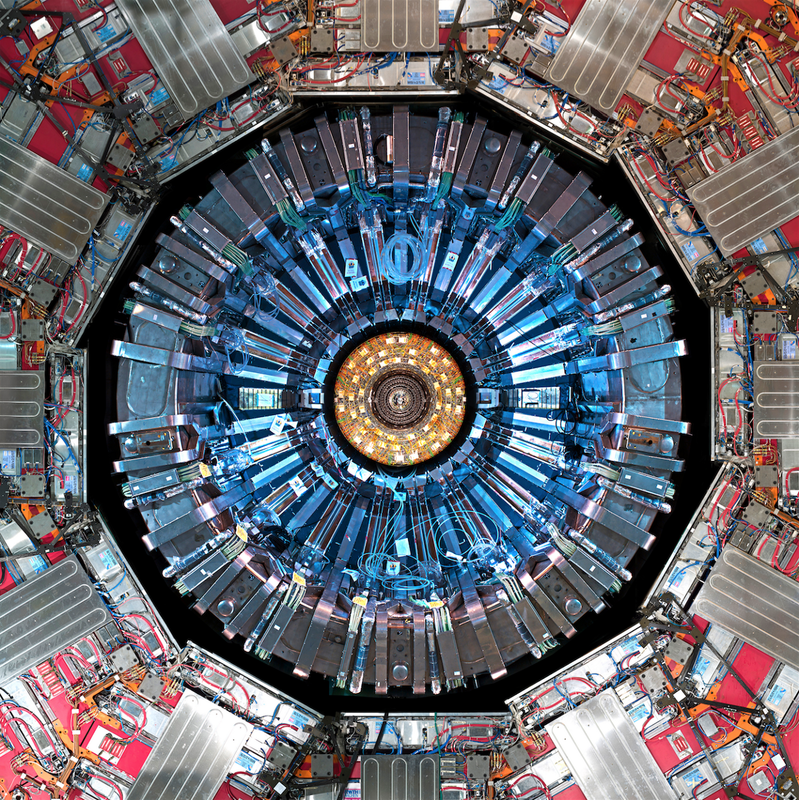 There is thus much that is new for these two authors to discuss, because computers and new algorithmic models have produced an array of new methods and designs. The book by Manuel Lima (The Book of Trees) focuses on trees exclusively, although some of them you may not have recognized as trees. 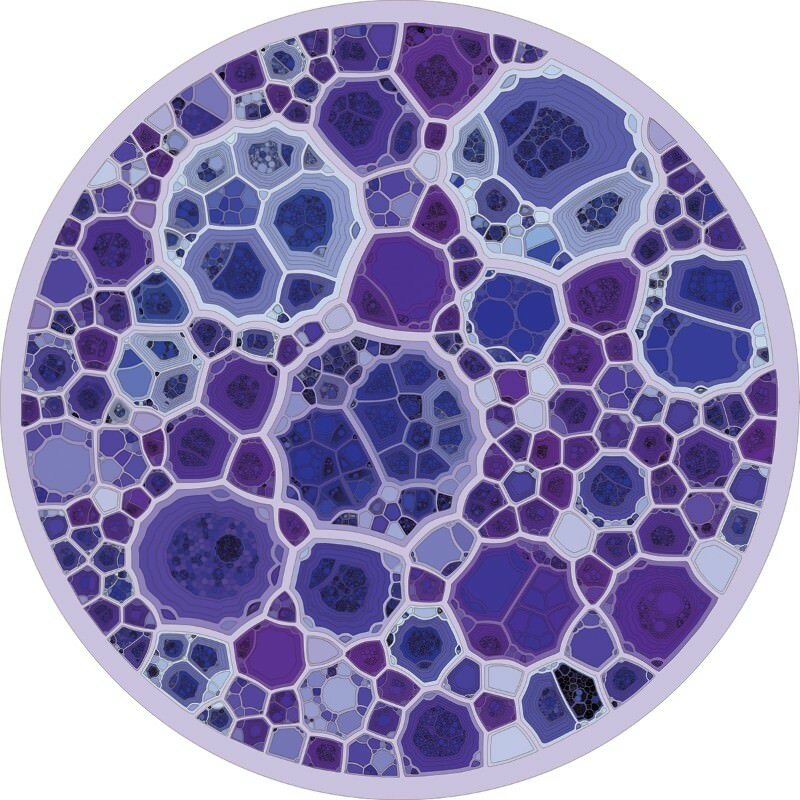 The book is arranged by type of tree: Figurative trees, Vertical trees, Horizontal trees, Multidirectional trees, Radial trees, Hyperbolic trees, Rectangular treemaps, Voronoi treemaps, Circular treemaps, Sunbursts, and Icicle trees. A tree is defined as representing hierarchically structured information, and therefore any such representation can be called a “tree,” including things that look more like maps and Venn diagrams than like traditional trees. Each chapter is arranged chronologically, which acknowledges the historical milieu noted above (covering more than 500 years). This means that the information being represented is not arranged by context, and thus conceptual themes recur throughout the book rather than being consolidated. For example, phylogenetic trees have historically been drawn as figurative, vertical, horizontal, multidirectional, radial, or hyperbolic (the latter being restricted to interactive trees), and so phylogenetic trees are illustrated throughout the book. Moreover, some trees could easily fit into more than one chapter, such as the horizontal trees on pp. 98–101, which could as easily be seen as multidirectional. This means that the book provides only a visual overview of trees, rather than providing some sort of critical commentary and intellectual review. The book simply starts with one type of tree diagram and ends with another type. This is the book's biggest weakness—it focuses on the visual characteristics and historical circumstances, rather than on the theoretical aspects. I strongly felt the lack of a critical overview of what trees can and cannot do in terms of representing information. A tree can be a clever way of displaying data, but that does not mean that it is necessarily a clear way of displaying it, and this distinction is insufficiently emphasized in the book. It is thus important to recognize that a beautiful-looking tree does not necessarily represent information accurately. As but one recent example, D'Efilippo and Ball (2013) produce a classic Tree of Life drawn as a real tree (as inaugurated by Haeckel 1866). Unfortunately, quite a number of the taxonomic labels are misplaced, and we are therefore treated to some rather surprising pieces of alleged phylogenetic and systematic information. Nevertheless, Lima's book does present us with a pictorial buffet of the sheer variety of Trees of Knowledge, both in terms of what they can look like and what information they can convey. The oldest images are the most beautiful, of course, as modern ones have become more stylized, adhering to Edward Tufte's dictum that information is most clearly displayed by using the minimum amount of ink possible. I think that Tufte is right in general, but I do miss the old, more discursive, style. The treemaps are probably the tree images that are most unfamiliar to systematists and phylogeneticists, who have traditionally favored lines to display informational connections (i.e., the “node-link” tree layout), rather than using nested areas (i.e., space filling) to represent hierarchical information. Nevertheless, this is what treemaps do—each branch of the tree is given an area, which is then tiled with smaller areas representing sub-branches. The main advantage of using a map as a representation is that the size and color of the areas can be used to represent other information about each tree leaf. This idea has, on occasion, been adopted in biology. For example, taxonomic hierarchies are sometimes represented using a treemap, such as in the web database BioNames (which displays the taxonomic groups recognized by the Index to Organism Names database), and the Natural Science Museum of Barcelona (which allows interactive access to the database records via a taxonomic hierarchy). It has also been used to display the gene ontology associated with gene expression data from microarray studies (Baehrecke et al. 2004) as well as other ‘omics data. It has even been suggested that treemaps could be used to represent phylogenetic trees (Arvelakis et al. 2005). Trees and treemaps also appear in the book by Isabel Meirelles (Design for Information), although this book covers much more than that. This time the book is arranged by subject: Hierarchical structures (trees), Relational structures (networks), Temporal structures (timelines and flows), Spatial structures (maps), Spatio-temporal structures, and Textual structures. Meirelles thus paints a much broader picture of data visualization and information design than does Lima, with trees as merely one possible iconography—in terms of coverage her book is broader but shallower. Meirelles also has a much stronger pedagogic philosophy than does Lima. Representing multidimensional information in two dimensions is not trivial, and Meirelles' goal is to provide a combined discussion of the technical requirements and the design aspects of such visualizations. She insists that “understanding the constraints and capabilities of cognition and visual perception is essential” (p. 9), because her emphasis is on design rather than information. Her writing thus focuses much more on the theory, while still insisting that it is successful practice that is the ultimate goal. Phylogenetic diagrams are few in her book, and all of them are gathered in the chapter on trees. Surprisingly, none of the examples used appear in the book by Lima. As an aside, I am not sure that either author actually understands phylogenetic trees. For example, one of Lima's labels starts with: “One of the first phenetic diagrams, also known as `cladograms,’ produced by numerical methods” (p. 103). (This figure was allegedly published in something called the “Oxford Journal of Systematic Biology”, which you and I know as Systematic Zoology; this is far from the only bibliographic error in his book.) Furthermore, neither author shows any interest in anthropology in either of its venerable guises as linguistics (language studies) or stemmatology (manuscript studies), both of which have long used trees to represent genealogies sensu lato. Interestingly, Meirelles shows that treemap methods were used in systematics long before the invention of computers (Lima notes only that they first appeared in cartography in 1845). Indeed, we can produce a treemap if we simply cut horizontal slices out of a vertical tree, as shown on p. 28 of Design for Information, which reproduces Maximilian Fürbringer's (1888) tree of bird relationships. On the left is the side view of the tree, and on the right are three slices through the tree branches (as viewed from above). The latter produces a circular treemap, which is admittedly a less efficient use of the visualization space compared to a rectangular one. In spite of the chapter on relational structures, phylogenetic networks do not explicitly appear in Meirelles book, which I personally consider to be a major, if forgivable, oversight. The book's networks are strictly of the type that connects observed nodes via observed links, rather than connecting observed (leaf) nodes via inferred (internal) nodes and inferred links. That is, none of them use the network to represent temporal relationships, let along evolutionary ones. Nevertheless, phylogenetic networks of a sort do appear in the book. A network is not a nested hierarchy, but instead involves a collection of overlapping sets. This can be represented as a Venn diagram, for example, but not as a treemap. This form of visualization has also been a longstanding suggestion in phylogenetics. Two of these appear in the book. One is Goldfuss' (1817) set of nested egg-shaped sets, expressing his ideas about affinity relationships, with one set overlapping several of the others, representing a nonnested series of relationships. The other is Swainson's (1837) quinarian figure of nonoverlapping sets, expressing his ideas about multidimensional affinity relationships. Oddly, both figures are in the Hierarchy chapter not the Relational one, presumably reflecting the nested part of their information rather than the concomitant reticulate information. Both books, by Lima and Meirelles, are beautifully produced in full color, and the images dominate rather than the text. If you do not mind the limited range of iconography, then these books can be viewed as being about art just as much as information. That is, they show us infographics in the original sense, before people started putting cute cartoons all over them to distract attention from the actual information. I recommend both books as a feast for sore scientific eyes. These hierarchical treemaps “epitomize the recent growth of information visualization”, writes Manuel Lima in The Book of Trees: Visualizing branches of knowledge. And as big data engulfs labs and lives, the need for such powerful visualisations will only increase. This omission is all the stranger given that Visual Complexity, his previous book, drew on several critiques, including some by French philosophers Gilles Deleuze and Felix Guattari. There, Lima summarised their views approvingly: trees are “authoritarian, unidirectional, and stagnant”, contrasting them unfavourably with network maps. However, for any diagram to be properly interpreted, its limitations must be fully grasped so that we know which qualities it can’t represent, or, at least, can’t represent effectively. For example, the Mercator map of the world is good for sea navigation, but bad for judging the relative size of continents: one of its key limitations is the representation of landmass. Likewise, suppose you wanted to use a tree to show the World Wide Web’s structure. This would represent it very poorly, since its structure is a network, not a hierarchy. Manuel Lima, The Book of Circles: Visualizing Spheres of Knowledge, Princeton Architectural Press, 2017. 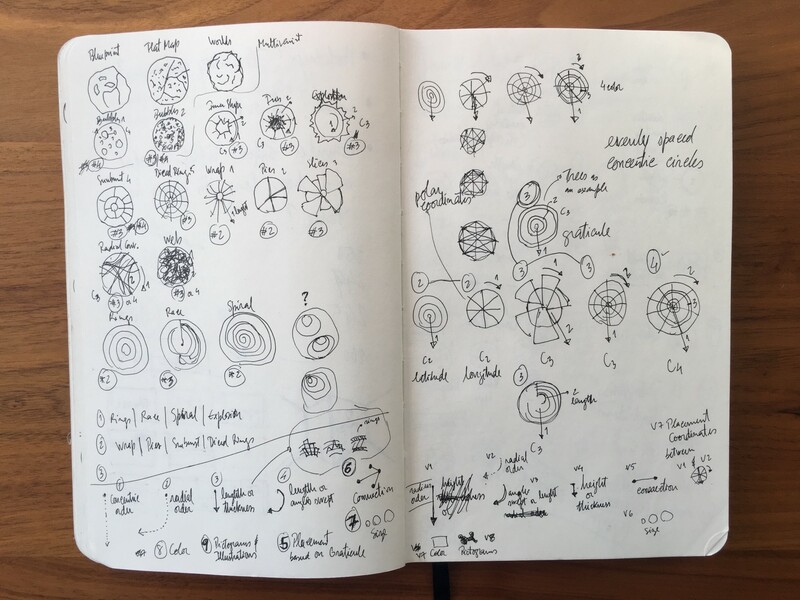 After 4 long years of research, roughly 2,000 exchanged emails, 50,000+ written words, plenty of sketches and notes, The Book of Circles: Visualizing Spheres of Knowledge is finally available. It was February 2011, and I had just finished giving a lecture at the Image in Science and Art Colloquium, organized by the University of Lisbon’s Center for Philosophy of Sciences. After I’d answered a few questions from the audience, one of the many professors in the auditorium stood up and asked, “Why do most of the visualization models you showed tend to follow a circular layout?” As the chair of the session, entitled The Emergence of Information Visualization, I was not only intrigued by her question but also somewhat vexed that this plainly evident observation had never occurred to me. “That’s a great question,” I said, pausing, and followed with a candid reply: “I don’t exactly know why.” To say this question lingered with me for quite some time would be an understatement. Later that same year, in September 2011, while presenting my first book Visual Complexity: Mapping Patterns of Information at the New York Public Library and retelling this story in private to an audience member, I became enthralled by the mention of an experiment that established a correlation between circular shapes and happy faces. From that point on, I became consumed by this topic. It took me a few years to articulate my thoughts, but in many ways, The Book of Circles constitutes an answer to that original question. Circles are truly everywhere. We can witness this elemental shape in faraway planets and stars; in earth formations such as mounds, craters, and small lakes; in the sections of tree trunks and plant stems; in the moving ripples on the surface of water; in a variety of leaves, fruits, shells, rocks, and pebbles; in the eyes of our fellow humans and other animals; as well as in cells, bacteria, and microscopic organisms. 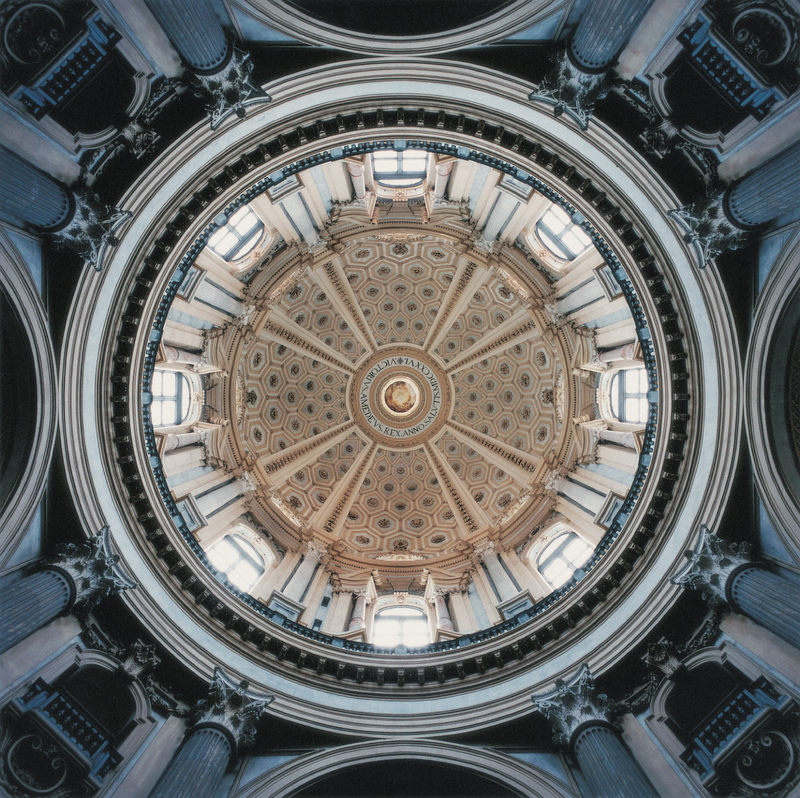 Over time, the circularity exhibited in nature also became a chief guiding principle of human culture, emulated and reinvented in art, religion, language, technology, architecture, philosophy, and science. 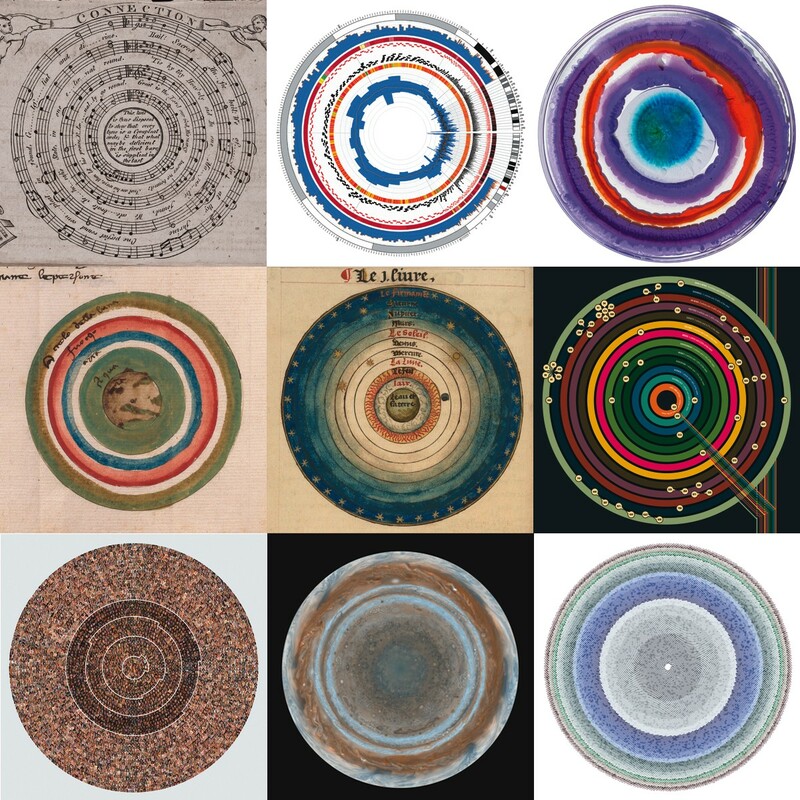 Used to represent a wide range of ideas and phenomena pertaining to almost every domain of knowledge, the circle became a universal metaphor embraced by virtually every civilization that has ever existed. We can see them as an organizing model in the cities and buildings we inhabit, the objects and tools we use, and the symbols and diagrams we construe to make sense of the world around us. Of all possible models and configurations why is the circular layout such an exceptionally popular choice? This book aims to answer this question in three distinct ways: first, by providing a context for the universality of the circular shape as a cultural symbol in all domains of human knowledge, across space and time; second, by describing a set of perceptual biases, identified by cognitive science in recent years, that explain our innate preference for all things circular; third, by developing a comprehensive taxonomy of twenty-one visual archetypes for depicting information, which showcases the diversity and flexibility of the circular design. With more than three hundred images, the book is a celebration of the enduring appeal of the circle, not just in the realm of information design, but in every sphere of human expression. 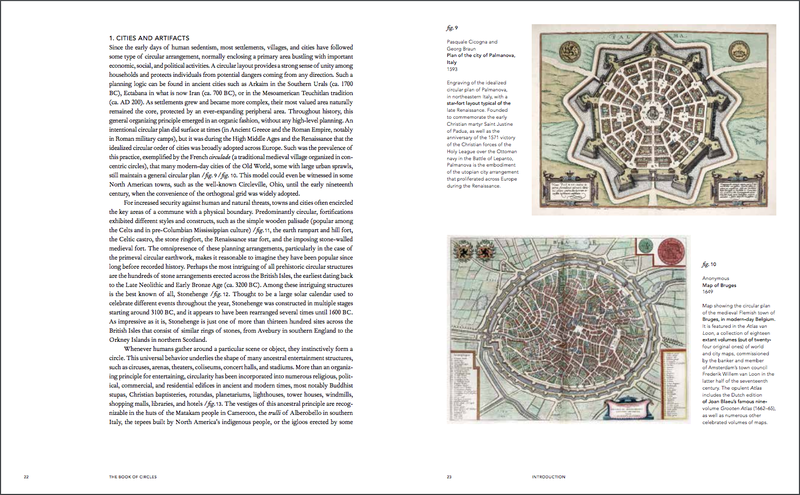 As some attentive readers might notice, The Book of Circles is similar to my previous title The Book of Trees, not just in its name, design, and layout, but also in its choice of a subject: a universal visual metaphor used for centuries across the globe. However there are some noticeable differences in its structure. 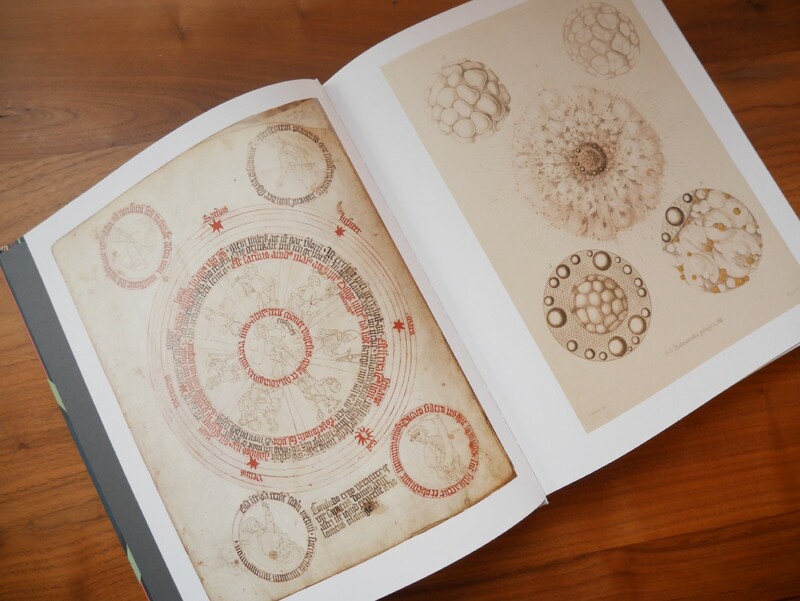 Whereas The Book of Trees traces an evolutionary history of the tree diagram by showcasing all images and models in a chronological order, The Book of Circles intentionally mixes time and space to better convey the universality and timelessness of the circular layout. This is why you may notice a contemporary project from, say, 2012 adjacent to one from the fifteenth century. 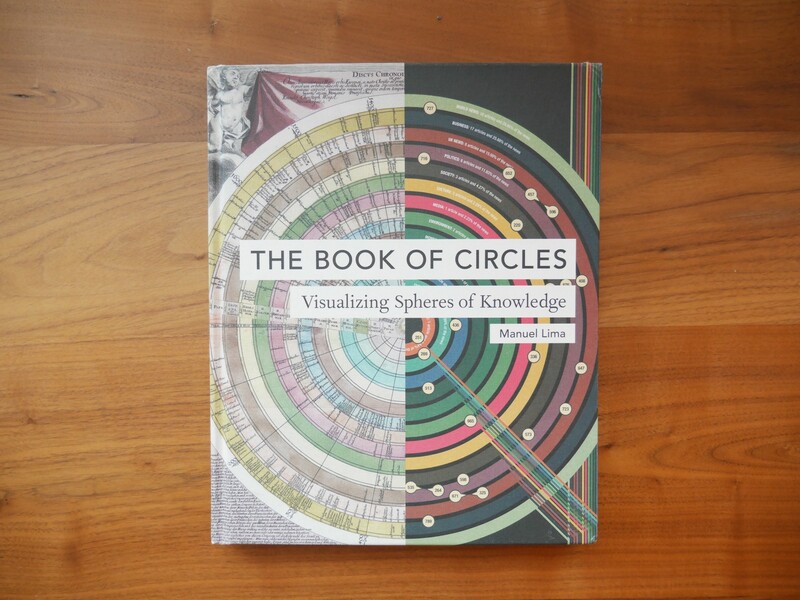 Moreover, The Book of Circles is broader in scope, which means that next to the multitude of examples from information visualization you will find many specimens from other disciplines, such as art, architecture, biology, cartography, archeology, and astronomy. From the beginning it became clear that if the book’s taxonomy attempted at some level of inclusiveness, its reach would need to extend well beyond the domain of information visualization and look much further back than our present-time. Why should we contemplate history, one may ask? The answer is simple: because the past continuously revisits the present. Notwithstanding our advanced modern tools and piles of new data, we continue to use visual metaphors that are similar and at times identical to those used to convey knowledge throughout history. In addition, many of these enduring visual motifs are also highly adaptable and have recurrently traversed disparate disciplines. The juxtaposition of seemingly contrasting areas and time periods is one of the unique aspects of the book and, ultimately, a testament to the circle’s exceptional adaptability. 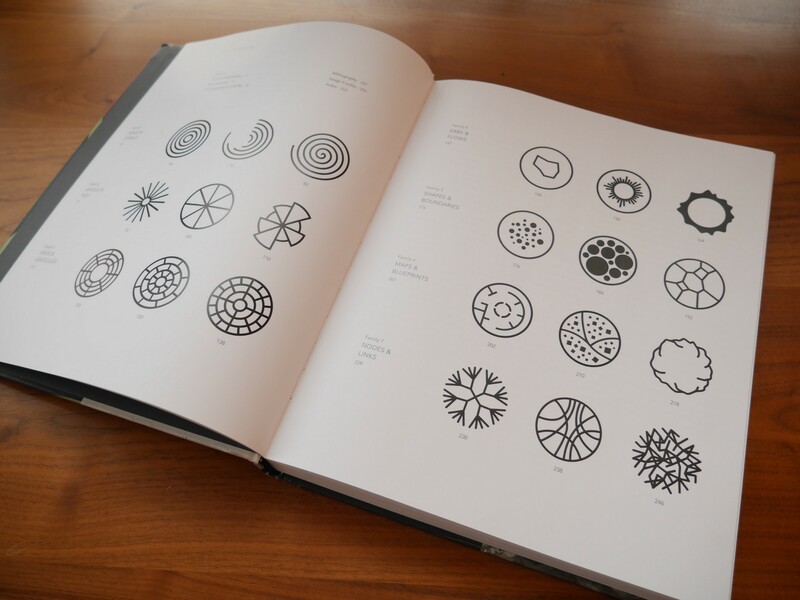 The book opens with an extended Introduction that provides a rich history of humanity’s long-lasting fascination with all things circular. It starts by exposing the principle of circularity in our material culture, from primordial human settlements and modern cities, to numerous physical products and artifacts. It then delves into the predominance of the circular shape in the evolution of ideograms, alphabets, and symbols, before expanding on its most prevalent universal associations — perfection, unity, movement, and infinity. The Introduction ends with a set of evolutionary explanations for our proclivity to rounded shapes, based on several studies and experiments in the domains of cognitive science and human perception. Following the Introduction, A Taxonomy of Circles expands on the motivations for the classification underpinning the entire volume, as well as the rationale for each visual archetype and respective family. Coming up with the final taxonomy was arguably the hardest task of all — yes, harder even than managing permissions for 300+ images —, and the countless scribbled notebook pages (see below) attest to the arduousness of this undertaking. 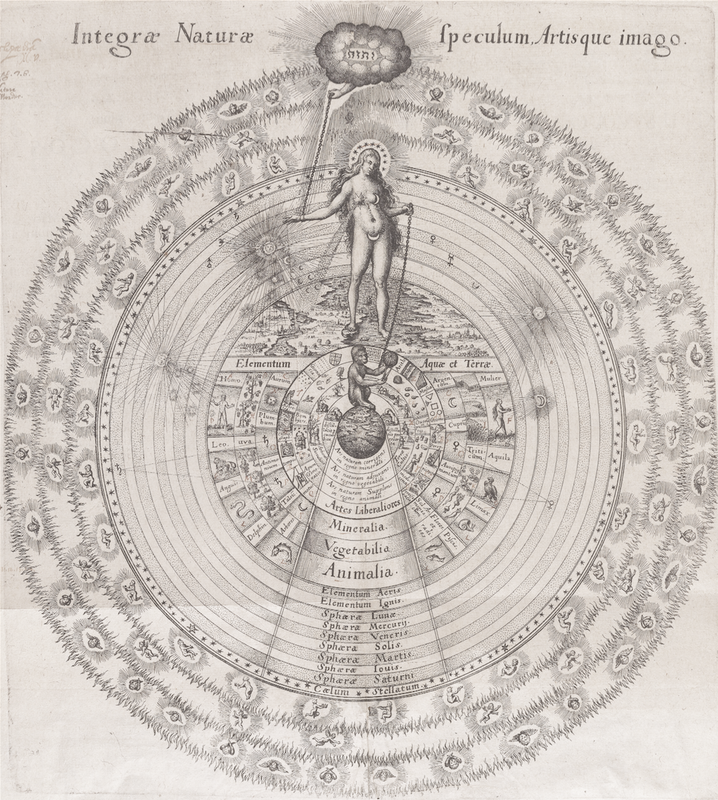 The vast number of charts, diagrams, maps, blueprints, and photographs featured in the book were arranged in twenty-one unique patterns based on their visual configuration and then grouped into seven archetype families. Each family comprises three patterns. While the twenty-one individual models were left unnamed, in part to highlight the weight of its visual motif, the seven families have descriptive labels, respectively: (1) Rings & Spirals, (2) Wheels & Pies, (3) Grids & Graticules, (4) Ebbs & Flows, (5) Shapes & Boundaries, (6) Maps & Blueprints, (7) Nodes & Links. Manuel Lima, Visual Complexity: Mapping Patterns of Information, Princeton Architectural Press, 2011. Until August 30, 2009, I knew little about Manual Lima and his work beyond the fact that he ran the data visualization website www.VisualComplexity.com. 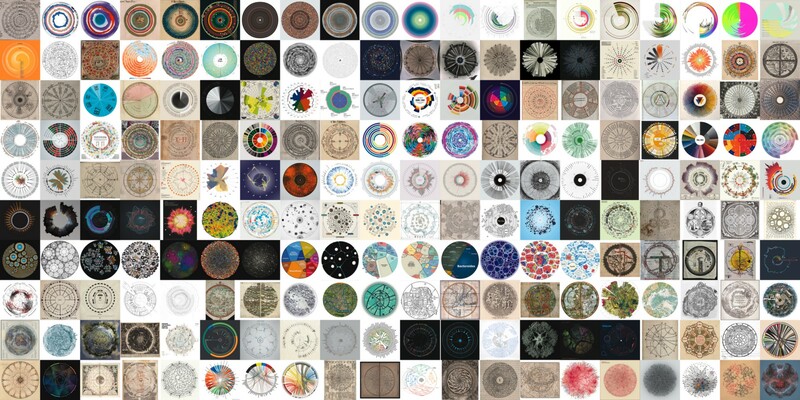 When he published his “Information Visualization Manifesto” on that day, however, I recognized him as a kindred spirit: someone who believed that data visualizations should be designed to enlighten. When I recently heard that he had written a book, Visual Complexity: Mapping Patterns of Information, I was eager to read it. I finally had my chance, and here are my thoughts. It’s important to recognize up front that this book is not about data visualization in general but about network visualization in particular. This is also the focus of www.VisualComplexity.com, where Lima showcases hundreds of network visualizations. If you share his intense fascination with networks (their nature, ubiquity, and complex beauty) and the many ways that networks can be represented graphically (various display approaches, the history of their development, and their potential as art) you will probably enjoy the intellectual meanderings in this book, which ventures at times into philosophical speculation. However, if you want to understand how network visualizations work, what makes them effective, when to use one approach rather than another, or how well the many examples in this book perform as vehicles of insight, you will be disappointed. I believe that the merits of a book should be judged by how well it achieves what the author promises. Authors of a non-fiction work such as this should always declare their objectives­ and do their best to fulfill them. In the introduction to Visual Complexity, two of the ways that Lima characterizes the book are not satisfactorily delivered: 1) he says that the book “looks at the depiction of networks from a practical and functional perspective,” and 2) he describes it as a “comprehensive study of network visualization [that] should ultimately be accessible to anyone interested in the field, independent of their level of expertise or academic dexterity.” Given the focus of my work, I was particularly interested in the book’s ability to live up to these two goals. In a short section of the third chapter, Lima presents a few principles for the design of network visualizations, but he never applies those principles to the visualizations that appear throughout the book. How can we learn from those examples, many of which are incomprehensible given the brief descriptions that accompany them, without an explanation of the insights that they pursue and a critique of their effectiveness in capturing and revealing those insights? Network visualizations are notoriously difficult to fathom, often looking like giant hairballs of complexity. Even when they’re well designed, they usually require instruction and practice to decipher. A comprehensive treatment of network visualization must do more than showcase examples; it must help us fathom the depths. In a section of the book that I found helpful, Lima categorizes network visualizations by differences in form (arc diagrams, area groupings, centralized burst, etc. ), but makes no attempt to describe their various strengths, weaknesses, or appropriate uses. When we should select one form instead of another is never hinted. Lima exhibits many network visualizations, breaks them into categories, and provides a wee bit of guidance, but spends most of the book’s 257 pages delving into history, philosophy, science, and art with the erudition of a museum curator. The breadth of his knowledge is impressive, spanning several fields, which he weaves into an interdisciplinary network of ideas. Academics in the field will find his tour thought provoking. While interesting, however, it feels like an intellectual exercise with no bridge to the real world. More and more today we need to understand networks, from the microscopic world of neurons in our brains to the macroscopic realm of social movements and the World Wide Web. I kept looking for content in this book that I could apply to these challenges in practical ways, but found little. In the chapter titled “Complex Beauty,” Lima speculates about the causes of our attraction to “depictions of complex networks.” I found his speculation interesting, but couldn’t help wondering if its premise were indeed true. Are people naturally attracted to complex network visualizations? Who comprises the “we” that experiences this allure? I suspect that network visualizations are alluring to people like Lima and me who work in the field, but few others. The final chapter of the book, “Looking Ahead,” seems out of place, a misfit as the book’s finale. It consists of four essays by others working in the field, but the topics of these essays don’t focus on network visualization and in two cases don’t deal with networks at all. Each essay is thoughtful but only peripherally relevant to the book. Those with expertise in network visualizations will find this book engaging; a worthwhile addition to their library. Those looking for a comprehensive, accessible, and practical guide to network visualization must prolong the wait. Perhaps Lima will provide this book in the future. He is perhaps better qualified than anyone else. If so, I invite him to descend from the lofty heights of aesthetic musings to the realm where real networks wait to be revealed.